The landlocked Republic of Burundi lies on the eastern shore of Lake Tanganyika in Central Africa. It is bordered by Rwanda to the north, Tanzania to the east and south, and the Democratic Republic of the Congo to the west. Burundi is a member of the Paris Convention and the WTO/TRIPS. The Law makes provision for the registration of trade marks for goods and services, collective marks, certification marks, and geographical indications, and for the protection of trade names. Patent protection is available by way of a national filing. 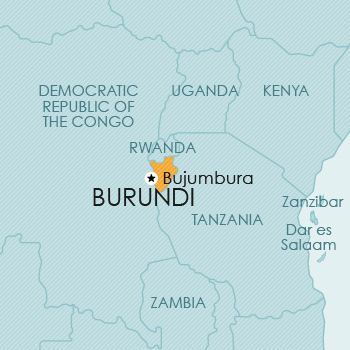 Burundi is a member of the Paris Convention so that convention priority may be claimed. Burundi is not a member of the PCT so that applications cannot be filed in Burundi via PCT. However, the Law does provide that the Industrial Property Director must take into consideration an international search report and an international preliminary report issued under PCT. Although regulations to implement the 2009 Law have not yet been promulgated, the 2009 Law is currently applied by the Registrar. Design protection is available by way of a national filing. Burundi is a member of the Paris Convention so that convention priority may be claimed. There is provision for the registration of copyright in Burundi under the Copyright Act No. 1/021 of 30 December 2005. Plant breeders’ rights are recognised and governed by Decree No. 100/055 of 23 March 2016, relating to the protection of plants. Seeds are governed by the Seed sector Act No. 1 /08 of 23 April 2012.